Starring Edmond O'Brien, Joanne Dru, Otto Kruger, Barry Kelley, Dorothy Patrick, Sammy White, Don Porter, Howard St. John, Robert Osterloh, Bert Freed. As postwar crime films became more realistic, they began to comment on the nation's organized crime syndicates, a reality that even the F.B.I. sometimes denied. 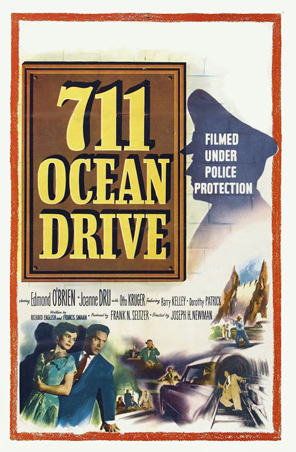 A smart film noir about a crooked Horatio Alger let loose in the racketeering game, 1950's 711 Ocean Drive must have posed a problem for the Production Code. Despite the negative things that happen to our working-class hero, the film's primary lessons are: 1.) The law-abiding world and its rules are for chumps. 2.) Smart, ambitious guys aim for the fast-buck opportunities without hesitation. 3.) Because everybody else is only out for themselves too, the only reasonable course of action is to be selfish, ruthless and swift in one's business dealings. To counter this cynical undercurrent about American ethics at the beginning of the great economic boom, 711 Ocean Drive is bookended by conflicting messages. Even its poster art prominently bears a silhouette graphic of a policeman, insisting that the film promotes law and order. In search of a short cut to the easy life, telephone technician Mal Granger (Edmond O'Brien) squanders his pay betting on the races. Bookie Chippie Evans (Sammy White) introduces Mal to Vince Walters (Barry Kelly), a low-level independent racketeer. Vince would like to expand his poorly organized "wire service", an information distribution center that services bookies for a fee. With his expertise in electronics, Mal builds relay systems that enable Vince to open more wire service hubs. He also invents transmitting equipment for racetrack "agents" like Trudy Maxwell (Dorothy Patrick) to communicate race results to the illegal betting pools. When the time is right Mal holds out for a piece of the racket, and Vince has no choice but to comply. After a desperate bookie murders Vince, Mal takes over the wire service. He moves into the big time, which comes with a beach house in Malibu (the address of the title?). The Eastern Syndicate run by Carl Stephens, Larry Mason and Steve Marshak (Otto Kruger, Don Porter & Bert Freed) muscles in on Mal's racket. As he keeps no gangland enforcers of his own, Mal partners with the syndicate, allowing Larry Mason to supervise operations. Mal takes a shine to Larry's wayward wife Gail (Joanne Dru), and after Larry beats her up, hires the unscrupulous Gizzi (Robert Osterloh) to murder Larry. This makes Mal suspicious to both the Syndicate and Lt. Wright of the Gangster Squad (Howard St. John). Mal uses another technical trick to cover his murder of the blackmailing Gizzi, but the cops see through his ruse. Rather than retreat, Mal takes Gail and Chippie to Las Vegas for one more piece of electronic subterfuge, a daring attempt to cheat the Syndicate's betting pools out of $250,000. Can he pull it off? 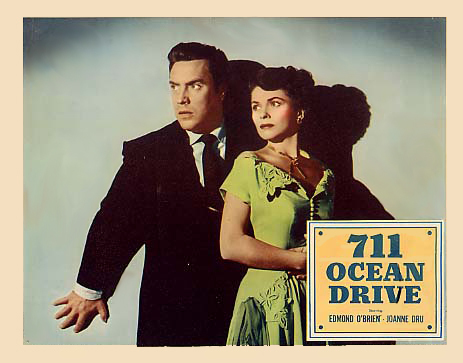 711 Ocean Drive would seem to spring directly from the previous year's White Heat, which took great pains to explain to the audience how Edmond O'Brien's treasury agent rigs a "bedside radio" to serve as a homing device. Electronics whiz Mal Granger applies the latest technology to the rackets. The kinds of things he does chime right in with the growing importance to American success of soft information over hard products. Accurate racetrack information = money, and when Mal can supply and distribute this info, he displaces the generic thug with a machine gun as the most important man in the mob. In a theme that harmonizes with modern software "magic", Mal's underhanded tricks all involve the manipulation of information: expediting information, delaying it and concealing its source. The racetrack cops can spot and arrest "signallers" like Trudy, but Mal rigs a transmitter onto an old guy with a cane (the antenna! ), who can then simply radio the information to a receiver in the parking lot. The old conman even gets a racetrack cop to help him read the odds numbers into his "hearing aid". Mal uses another relay device to fool the cops into thinking that he's in Palm Springs, instead of near a Malibu murder scene. 1 At the conclusion, Mal delays racetrack results just long enough to allow his ringers to place winning bets, a gag that uses a literal "tape delay" setup. One man accomplishes what Robert Redford and Paul Newman needed a huge staff to pull off in The Sting. This may be director Joseph M. Newman's best movie; it's an exciting script and everybody contributes top work. Newman's crew is headed by super-ace cameraman Franz Planer, and the extensive use of locations makes the production look very expensive. Edmond O'Brien was on a noir roll at the time, just off the major hit D.O.A.. He's a mass of energy on screen -- nobody plays nervous better. We can see why women might go for the energetic, self-confident and optimistic Mal. Not blessed with matinee idol looks, O'Brien succeeds as a romantic lead by will alone. The actor delivers a great dirty dialogue line that surely sailed over the noggins of the clueless censors -- when he's certain that he's ready to demand a partnership with his boss, Mal shouts, "It'll work -- now I got him by the short hairs!" That particular anatomical reference wouldn't be heard in a movie again for twenty years. It's really O'Brien's show but Joanne Dru is appealing as the society girl turned mob wife. It does seem odd that Gail would rebel against her abusive husband by taking up with an ex- telephone repairman ... you'd think she'd retreat back to someone in her social register. I suppose the screenwriters felt that the censors would sooner accept a glamorous mob wife, over a slumming wreck. Otto Kruger and Don Porter are sinister enough as the slick new mobsters. Howard St. John, better known later for comedy roles, is the colorless cop. The best support comes from Barry Kelley as the puffy-faced wire service entrepreneur who gets the show rolling. Kelley really comes across as a hard-case meanie, threatening the bookies that can't pay their loans. Sammy White is likable as Mal's only faithful pal. Dorothy Patrick's Trudy foolishly thinks Mal might be seriously interested in her. Mal Granger isn't given a "good girl" as an alternative; in fact there are no uncompromised characters in the movie except for the cops. The only other woman in sight is a forlorn date that Mal dumps as soon as we meet her -- played by grim little Cleo Moore of all those Hugo Haas melodramas. The Sony Screen Classics By Request DVD-R of 711 Ocean Drive looks great. This is the first disc Savant is reviewing from this outfit, and the quality is beautiful, with an excellent, sharp transfer that looks a bit milky only in the main titles. Franz Planer's deep-focus cinematography really pops, and we can even pick out the different fabric textures in the costumes. The original trailer mentioned above is included; it's in perfect shape as well. The Warner Archive Collection introduced the marketing concept of made-to-order DVD-Rs. Sold only on the web, they sidestep most of the marketing infrastructure of normal home video distribution. MGM followed with a botched Limited Edition Collection venture but didn't publicize it enough. Sony/Columbia doesn't possess the library width or breadth of Warners or MGM, but much of their inventory has been transferred to HD, and they can muster excellent transfers in the correct aspect ratios. The Sony Screen Classics By Request program has also made a significant opening bid, releasing its first 100 titles all in one go. The bottom line is that the disc of 711 Ocean Drive is just as attractive as any standard DVD released by the studio. 1. A random noise heard on the recording of the relayed telephone call trips Mal up. This clever plot device was re-used without alteration in Akira Kurosawa's High and Low. Frankly, audiences laugh when Mal tells Gail over the phone to hook up that "relay device with the two phone cradles" that just happens to be warmed up and ready in her Palm Springs hotel room. Gail complies as if the machine were a kitchen can opener. We're more prone to think that it would turn out a technical disaster, as in Preston Sturges' Unfaithfully Yours, where nothing works. "It's so easy, a child could do it!" 3. The movie says more than once that running a wire service is not strictly illegal. Taking bets in a book definitely is, so I wonder what the distinction is. 4. As usual, when I reach for a conclusion like this, I'm dead wrong. Author Sean Howe graciously directed me to his July 15, 2010 Blog on the Organized Crime Threat against the movie 711 Ocean Drive. It's a great, true story, and Sean has some terrific original location info and photos from the film as well. Reviews on the Savant main site have additional credits information and are often updated and annotated with reader input and graphics. Also, don't forget the 2010 Savant Wish List.